Pink, Peepers and a Peplum - An Outfit Post - Sugar, Darling? Hi sugarplums! So this outfit is a bit of a flung together thing but I actually really like it. 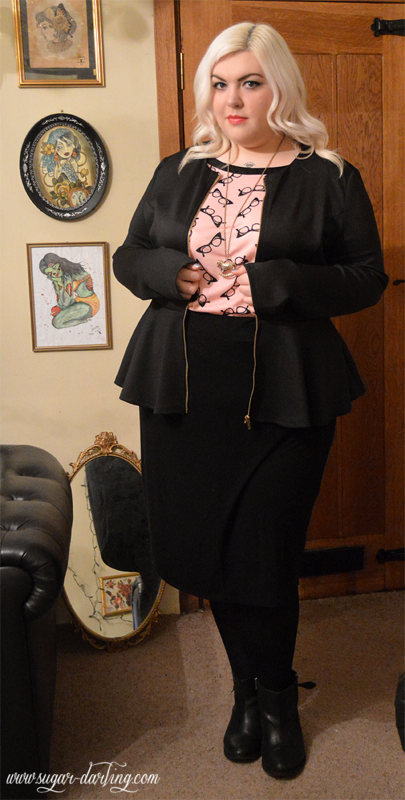 It was all born from my want to wear this tee as soon as possible after it came in the mail but thinking it was a little too casual for work I threw on the peplum jacket I bought at the Rad Fat Shopping meet up in Doncaster last week from the Simply Be sale. The jacket is by AX Paris and is a wee bit long on the sleeves so I'm gonna short them up next time I get my sewing machine out, but its so flattering and suits my shape perfectly. You can see from the photos that the peplum kicks out at exactly the right place on my waist - see ridiculous photo of me with my eyes closed below! Naturally I'm in love with the tee as it's mallow pink and has cat eye glasses printed all over it. 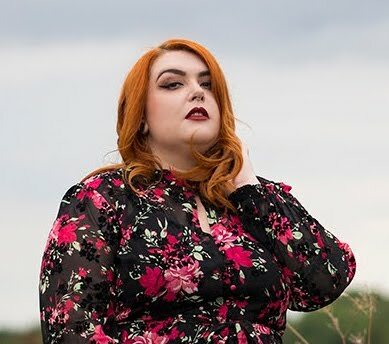 It even has black satin edging which is lovely, although that means you don't get any stretch over the tummy so if you want to wear it pulled down rather than tucked into a skirt like I have you may need to size up. FYI, it's also available in minty green and white if pastel pink isn't your thang. I've only recently become a fan of looser fitting boxy style tees and I'm not quite completely sold on the drop shoulder just yet, but I like how this looks tucked into a straight skirt and loosened a little to look like it has a bubble hem. I think it's a nice look and effortlessly turns a normal tee into a more formal look so it's great for extending your work wardrobe if you're pushed! I'm definitely on the lookout for more loose tees in funky unusual prints - let me know if you see any!!! I hope you're having a lovely weekend so far guys!